SNES Super Metroid (JPN/USA) "game end glitch" in 07:09.68 by Sniq, Total & Aran Jaeger. 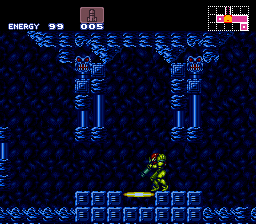 Super Metroid is a platform game and a follow-up to Metroid II. Like the previous games in the series, it is not divided into separate levels; the planet Zebes is an open world which Samus traverses back and forth. This world is divided into rooms separated with doors which must be shot to be opened. Shooting is also used to open up secret passages, some of which contain nifty bonuses, but finding most of them is required to proceed in the game. With a new moonwalking technique, this improves the previous speedrun by 4.99 seconds.